You don't need to know how to sew to make beautiful fleece blankets. In fact, a cozy blanket is the perfect lazy afternoon craft project. With no-sew fleece blanket patterns, you can whip up a blanket in an hour or two, giving you a decorative touch for your home or a special gift for a friend. If you need help downloading these patterns, check out these helpful tips. Print this pattern for a no-sew family blanket. This cozy blanket is wonderful for those chilly evenings in front of the fireplace or to cuddle under while watching a favorite movie. It's reversible, giving you two different looks to complement your decor. Expect to spend a couple of hours on this project, but there are no special skills required to make it. Click on the image of the fleece blanket pattern and download it. Print out the pattern and enlarge. Fold one of the fleece pieces in half with the short sides together. Fold it into quarters. Place the pattern on top of the folded fabric and cut through all four layers. Repeat with the other piece of fabric. Spread out one piece of fleece, and then spread the other piece on top of it. Line it up so the edges match and pin them together. Make 2.5-inch-deep cuts every one inch around the outside edge, going through both layers of fabric. This will create a fringe. Starting near a corner, tie one bottom piece of fringe to one top piece of fringe. Continue until you've gone all the way around the edge. Remove all pins. 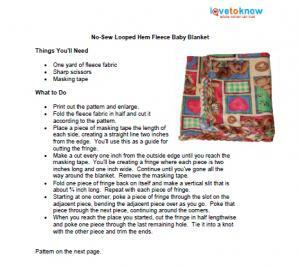 Print this no-sew fleece baby blanket pattern. 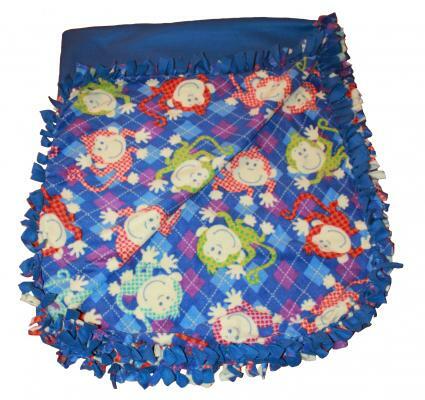 If you need a special gift for a new baby, nothing beats this adorable and easy-to-craft no-sew fleece baby blanket. It's a quick and easy project and will take about an hour to create. This blanket has a looped hem, which is a little different than a tied fringe. It gives the blanket a clean, finished appearance. Click on the image of the baby blanket pattern and download it to your computer. Enlarge and print out the pattern. Fold the fleece fabric in half and cut it according to the pattern. Place a piece of masking tape the length of each side, creating a straight line two inches from the edge. You'll use this as a guide for cutting the fringe. Make a cut every one inch from the outside edge until you reach the masking tape. You'll be creating a fringe where each piece is two inches long and one inch wide. Continue until you've gone all the way around the blanket. Remove the masking tape. 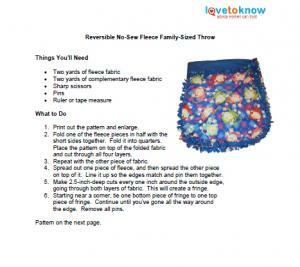 Fold one piece of fringe back on itself and make a vertical slit that is about 3/4 inch long. Repeat with each piece of fringe. Starting at one corner, poke a piece of fringe through the slot on the adjacent piece, bending the adjacent piece over as you go. Poke that piece through the next piece, continuing around the corners. When you reach the place you started, cut the fringe in half lengthwise and poke one piece through the last remaining hole. Tie it into a knot with the other piece and trim the ends. With a few yards of fleece, a free pattern, and a couple of hours of your time, you can create a beautiful and cozy blanket without getting out your needle and thread. These blankets make wonderful additions to gift baskets or stand-alone presents, and it's also great to keep a few around the house for chilly days.